The first idea of the French Crystal Palace was suggested by the English structure of the same name at Sydenham, about eight miles from London. Such a structure, as may be readily conceived, requires a site of vast extent, and one that shall be easy of access and possess the most agreeable surroundings. To the promoter of the project, those portions of the park of St. Cloud in the vicinage of the old chateau appeared to combine within themselves all the conditions that were desirable, and he, therefore, on the 15th of December, 1879, addressed the Ministers of Public Works and of Finances asking for the necessary concessions. The extensive specifications have been finally completed and will probably be shortly submitted for the approval of the parliament. The moment has arrived then for the public press to take cognizance of a project which concerns so great interests. THE FRENCH CRYSTAL PALACE--PARK OF ST CLOUD, PARIS. At present we shall say a few words à propos of the engraving we present herewith. 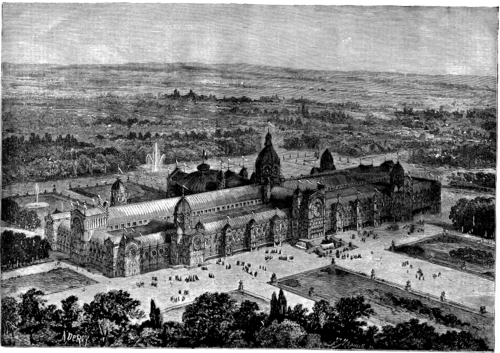 The French Crystal Palace will consist of one great nave, two lateral naves, two surrounding galleries, and a vast rotunda behind. The principal entrance, located at the head of the avenue leading from the present ruins (which will, ere long, be transformed into a most interesting museum), will exhibit a very striking aspect with its monumental fountain and the dome which it is proposed to erect over the very entrance itself. The whole structure will cover about nineteen acres of ground, thus being two and a half times the extent of the Palace of Industry in the Champs Elysees. The great nave of honor will be nearly 1,650 ft. in length, 78 ft. in width, and 98 ft. in height. The dome will measure exactly 328 ft. in height, or 105 ft. more than the towers of Notre Dame. The structure, with the exception of basement and foundation, will be of glass and iron. The project which we publish to-day has been studied and gotten up, according to the general plans and dimensions suggested by the promoter, by Mr. Dumoulin, the architect. We are informed that the builder is to be Mr. Alfred Hunnebelle, a contractor well known from the extensive works that he has executed, and who is president of the Syndical Chamber of Contractors of Paris. Among the annexes of this palace we may note a "Palace of the Republic," to be built on the ruins and designed for illustrious or distinguished visitors, such as the President of the Republic, the Ministers, the Municipal Council of Paris, foreign delegates, etc. ; a farm house for special exhibitions and a field for experiments; galleries, cottages, etc. As for the programme, which embraces six divisions and numerous subdivisions, we are unable to give it at present for want of space; we need only say that it satisfies perfectly all the conditions of so vast an undertaking. In the hands of the projector, Mr. Nicole, who is well known from his long experience in such matters, the exhibition will undoubtedly prove a success and be instrumental in adding prosperity to all French industries.